Cooler weather, fantasy leagues, brighter Mondays, later Thursdays, and a new meaning to #sundayfunday can only mean one thing — football season has arrived. I kicked off my football season at Reliant Stadium for the Tennessee Titans at Houston Texans game and what a way to start the season. Besides witnessing one of the best games of the season thus far, Texans fans know how to throw down for a football game, especially when facing their division foes. In an ironic rivalry twist, as much as Texans fans despise the Tennessee Titans, it’s the Titans they have to thank for their beloved Houston Texans franchise which only fuels this competitive fire, and it shows. But rivalries aside, Reliant Stadium is a great place to experience the NFL. I arrived to the Blue parking lot roughly an hour before kickoff and was shocked to see complete an utter chaos in the form of tailgating, it was awesome! When I say chaos I don’t mean a crazy R rated madhouse, I mean all ages in a completely succinct state of mind with one goal — root for the Texans. From DJs surrounded by flat screens to mini football fields in the parking lot, Houston Texans fans have tailgating down to a science. If you are ever heading to Houston for a game I recommend an early arrival to experience what may be the greatest tailgate you ever attend. 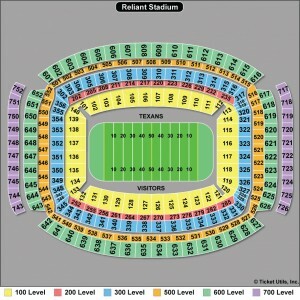 I am a huge fan of 50-yard-line seats, but it’s hard to complain about any lower level seat in Reliant Stadium. In fact the whole stadium utilizes the space well leaving few bad seats. The seats are as close to straight up as they can be which really puts the fans in the game. It was by far the loudest football game I have ever been to and you can’t help but join in with 70,000+ cheering fans. My wife and I were in the last row of section 104 just under the second level overhang. What I really liked about these seats is that they provided multiple hanging TV’s that displayed exactly what the two (non-visible) jumbo-trons at each end zone were showing. All in all I would and will make it back to many more Texans games and recommend it to all football fans. As far as concessions are concerned, I think there is an overall agreement that from High School to NFL football all concessions are too expensive. Now that we got that out of the way, beer at Reliant was fairly moderate and it came in a bottom up glass. If you have never experience the bottom up draft, it is a cup that fills from the bottom up. IMPORTANT NOTE…if you only take one thing away from this blog let this be it, the hole at the bottom of the glass does not lock so don’t try to push it in. Your beer will end up in your lap and that’s no good for anyone involved, trust me. To finish up, if you ever get a chance to attend a game that players from your fantasy team will be playing in, do it…and start those players. It was pretty sweet seeing Ben Tate bust out on a 60 yard run down the sideline and watching the rookie, DeAndre Hopkins, go up and grab the game winning touchdown to give me a 2-0 start in my fantasy league. You can catch the Texans at Reliant Stadium this weekend (Sep. 29) against the Seattle Sehawks which is likely to be a great game. Houston will also be hosting some of the best quarterbacks in the league this year starting with Andrew Luck and the Colts on November 3. It’s Texans vs. Patriots and their future HOFer on December 1, and then Peyton Manning’s Broncos on December 22.